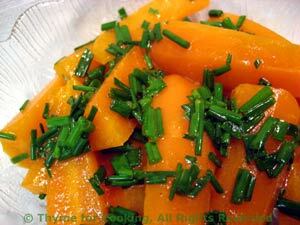 Carrots with Butter and Chives,Thyme for Cooking vegetable sides. These are delicious in the spring when the chives start coming up - as well as the rest of the summer. If you don't have access to fresh chives, substitute dried. Peel carrots, cut into sticks. Put carrots into a small saucepan or skillet. Add stock, cover and bring to a simmer over medium heat. Drain any remaining liquid from pan. Add chives and butter, stir well to coat and heat through. Remove from heat, add pepper if you like and serve.